We love, alright adore!, pasta in this house. Pasta can be pretty heavy though and as the weather starts getting warmer, I like to cook lighter. 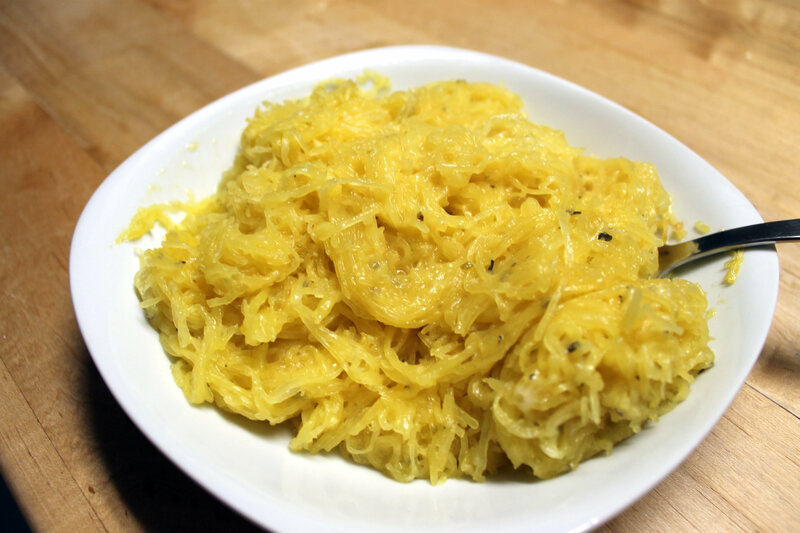 I’ve experimented with Spaghetti Squash a few times before but this recipe came out so well I just had to share it. 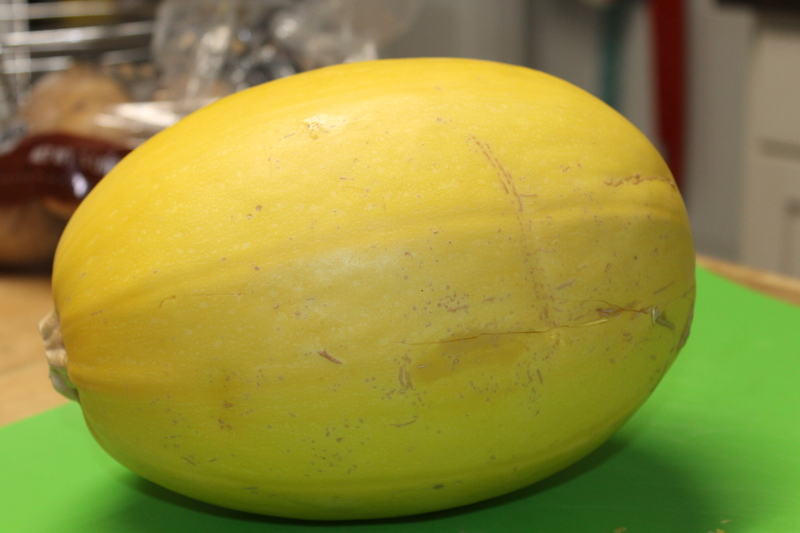 So first things first, you get this huge yellow squash at the store and quickly realize that it weights at least 3 to 4 pounds and would take an weed whacker to cut in half. Now what?! 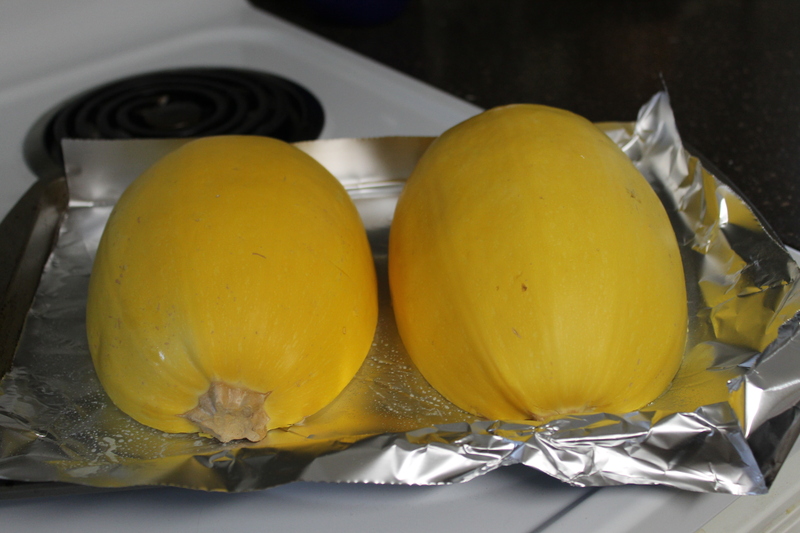 Place the whole squash, as is, on a microwave safe plate and cook in the microwave for about 3 or 4 minutes, depending on how big your squash is. Now you’ll have a much easier time cutting this delicious veggie in half with an ordinary kitchen knife. 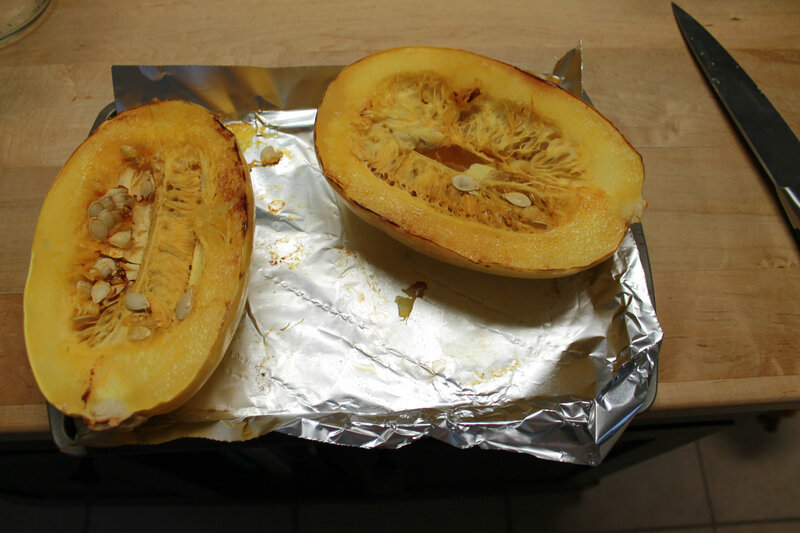 So go head and get the squash cut in half and placed, cut side down, on a cookie sheet covered with tinfoil and a bit of cooking spray. 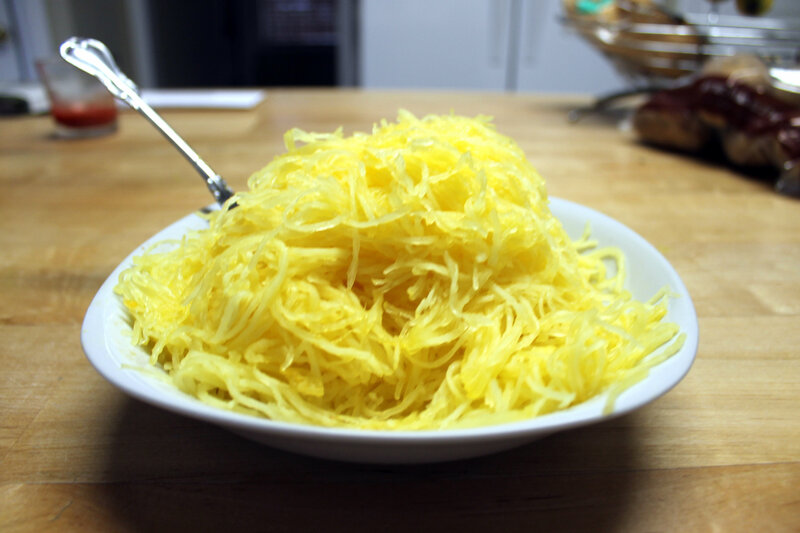 Cook it in an oven preheated to 375 degrees for about 30-35 minutes, again depending on how big it is. Once it’s cooked through take it out of the oven and let it cool! You’re going to have to hold it pretty good to scrape the good stuff out and as my finger tips can tell you, it’s HOT! 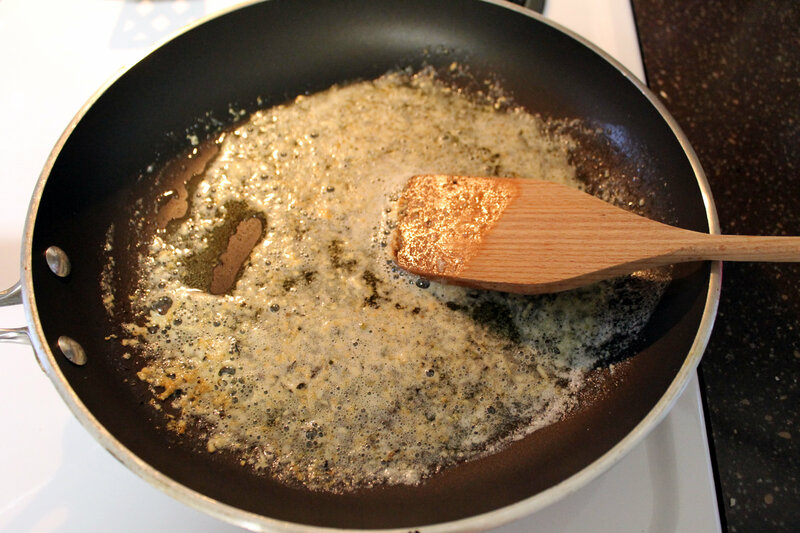 Heat up 2 tbsp of butter and 1 tbsp of olive oil in a skillet over med-high heat. Grate in garlic, or mince it of you don’t have a hand grater, and cook for a few minutes until fragrant. I added a bit of dried herbs at this point (basil, oregano and thyme) to taste. 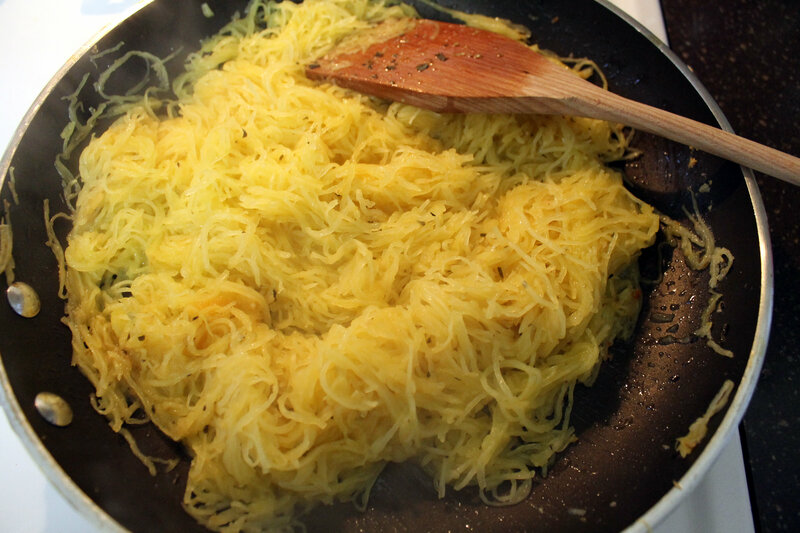 Add the spaghetti squash to the skillet and cook for a few minutes until coated in the garlic, butter and oil. I added about 1/4 cup of grated Parmesan cheese right before I took the skillet off of the heat. And there you have, a delicious and healthy summer side dish sure to please even those who don’t always like eating their vegetables! We had this with Meatball Sub Casserole and roasted brussel sprouts and Darrin is already asking for it again!